Italian Insider Chief Editor John Phillips is appealing for donations to help pay legal costs in a press freedom battle at the Rome Tribunal court against the FAO to prevent the UN agency silencing the English-language newspaper's unique reporting on corruption and mismanagement. Phillips faces a possible prison sentence and hundreds of thousands of euros in civil damages if he is convicted in the defamation case brought against him by the FAO Director General, José Graziano da Silva, for allegedly tarnishing the image of the FAO through the newspaper's investigative reporting. The Insider is appealing for readers and well wishers to donate, anonymously if they wish, to help the Insider cover legal and legal translation costs of thousands of euros in the case being heard next at the Rome Tribunal court on Jan. 15, 2019 at 12 a.m. The attack on the newspaper by the FAO threatens to drive the Insider out of business, land Phillips in prison under Italy's antiquated libel laws and set a dangerous precedent in preventing reporting on wrongdoing within the United Nations. We need your financial support, big or small, to help pay our ongoing legal costs and to cover the travel costs of an FAO whistleblower who is due to travel to Rome next month as a defense witness in the main criminal libel trial brought against me as chief editor. 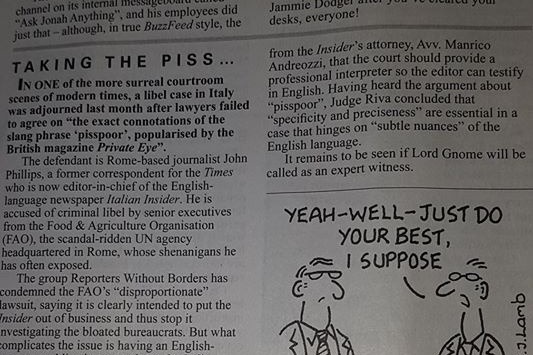 Attached is a report on the last hearing in the case in the British magazine Private Eye. With under two months before our next criminal libel hearing at the Rome Tribunal we need your support please to help cover travel costs to enable a whistleblower to fly half way around the world to appear as a defense witness in court and to cover our legal costs in the battle to prevent the FAO silencing us for allegedly tarnishing the image of the UN agency through our independent reporting. We also face ongoing legal costs in the second case that the FAO Director General, José Graziano da Silva, started against us which came to trial in a preliminary hearing in February. At that trial the FAO lawyer asked the judge to order the closure of the Insider on the ground that we are a 'clandestine publication.' The judge ordered that I as chief editor be placed under investigation afresh for that charge of suspected clandestine publishing also -- an antiquated charge going back to Fascist times -- and we are waiting to hear the ruling of the investigating magistrate who has been shown the documentation to prove that we are in fact an officially registered newspaper in italy. With less than two months to go to our next hearing at the Rome Tribunal we need your support please to help cover travel costs to enable a whistleblower to fly half way around the world to appear as a defense witness in court and to cover our legal costs in the battle to prevent the FAO silencing us for allegedly tarnishing the image of the UN agency through our independent reporting. We also face ongoing legal costs in the second case that the FAO Director General started against us which came to trial in a preliminary hearing last month. At that trial the FAO lawyer asked the judge to order the closure of the Insider on the ground that we are a 'clandestine publication.' The judge ordered that I as chief editor be placed under investigation afresh for that charge of suspected clandestine publishing also -- an antiquated charge going back to Fascist times -- and we are waiting to hear the ruling of the investigating magistrate who has been shown the documentation to prove that we are in fact an officially registered newspaper in italy. Our legal battle to prevent the FAO silencing the Italian Insider has entered a new stage as lawyers for the FAO at the start this month of the second criminal libel case brought against us by José Graziano da SIlva asked an Italian judge to close down our newspaper as "clandestine press." After the hearing at the Rome Tribunal Feb.7, the preliminary judge ordered that an investigating magistrate place Insider chief editor John Phillips under a new investigation for allegedly publishing our print edition without official authorisation though the Insider is officially registered as a newspaper at the Tribunale di Roma since 2017. The latest attempt by Graziano to curb press freedom means we face more legal costs to defend ourselves against the new charge while we also still need funds to cover travel costs of a defense witness who will be attending the next hearing May 7 of the first libel case brought against the Insider editor in chief for allegedly tarnishing the image of the FAO and four of its executives.